Simple mathematical rules can be used to create the most unexpected shapes and patterns, and nowhere is this more evident than in the world of plants and shells. In their 2013 project Botanica Mathematica, artist Madeleine Shepherd and mathematician Julia Collins have collaborated to explore how different mathematical knitting rules can mimic the growth of botanical forms. For example, the idea behind the ‘Binary Tree’ is that there is a main tree trunk which splits into two branches, which each split into two branches, which each split into two branches… until all the stitches are exhausted. It is a very simplified idea of how a tree really grows, but produces specimens which are remarkably similar to real trees. But nature never produces the same plant twice. In the same way that the environment creates variation within the same species of tree, each crafter will each interpret this pattern in a different way. Some will choose to knit, others to crochet. 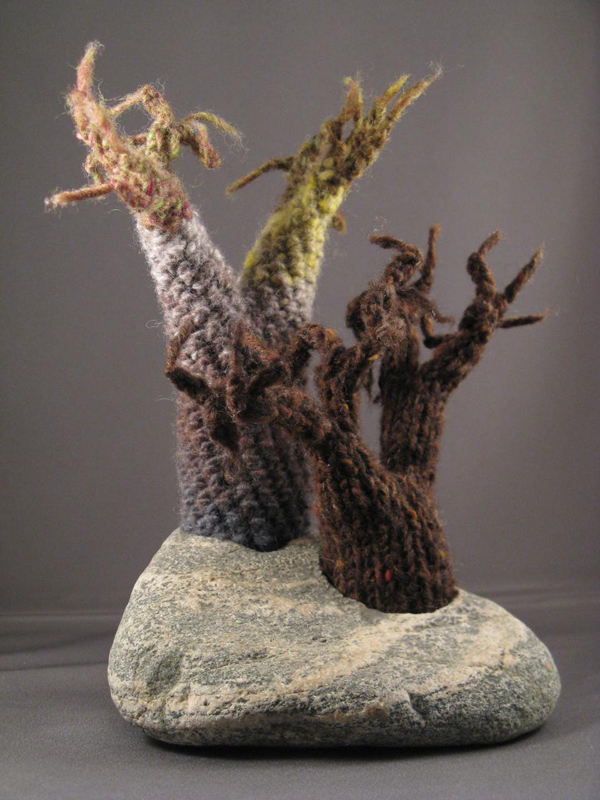 Some will use a single colour yarn, others will use variegated yarn or will change colour for different branching levels. Some will create a fixed number of rows between each branch, others will create randomly placed branches. Madeleine and Julia are looking for knitters across the country to pick up their needles, dig about in their yarn stash and have a go at some of their patterns. A simple rule like ‘increase at a constant speed’ can produce crazy varieties of lettuce, kale, coral and even chanterelle mushrooms! Or why not try making a Fibonacci flower with two colours and a rule called an ‘L-system’? The project will be running for all of 2013 as part of the Year of Natural Scotland and the year of Maths for Planet Earth. Botanica Mathematica will be at the Orkney Science Festival’s Family Day, where visitors can either bring along pieces they have already made or have a short tutorial in making something new. To read more about the project and the patterns, visit the Botanica Mathematica blog or read this article written for the American Mathematical Society. Julia and Madeleine showed their mathematical knitting in the 2013 Orkney International Science Festival, and Julia spoke on ‘The Mathematics of Knots’ and also ‘The Secret Maths of Twisting, Braiding and Dancing’. Dr Julia Collins is a mathematician who got her PhD in Knot Theory from the University of Edinburgh in 2011. She now works as the Mathematics Engagement Officer at Edinburgh, spreading the word about all the amazing maths research which goes on at the university. You can often find her in cafés around town writing a blog with her sheep Haggis or working on her latest maths knitting project.